With catwalk style and effortless practicality at the forefront of their designs for both men and women, Dune shoes and boots are easy to wear and will keep you looking and feeling on trend. You can enjoy the products even more when you save on the price by shopping with vouchercloud. For your office kitten heels, and even your holiday wedges - whatever your style and whatever the shoe - you are certain to find the footwear you love at Dune. Dune was first established in the early '90s as a new fashion shoe company offering interesting designs and cool footwear looks. A brand that you can always rely on, here you can be sure to invest in quality and style. Dune initially started out with concessions in other fashion stores, but also began to open its own branches as word of the fashion forward designs spread. Now, as one of the biggest names in footwear in the UK, and as a prominent shoe brand all over the world, don't wait to discover Dune today. How do I use my Dune discount code? If you were supplied with a voucher to use in store, either save or print it to redeem in your nearest Dune. Add Dune to your followed brands at vouchercloud to find out the latest offers, sales and new styles available - fuss-free! Where is my nearest Dune branch? Dune has a store locator facility on their website to help you find their nearest location to you if you want to shop in person. Does Dune offer a Student Discount? Dune has a generous student discount, offering 10% off your online order. To claim the Dune student discount, you will need to register with Unidays before shopping. Dune shoes come in UK sizes 2-9 for women and 6-12 for men, use the online size charts to convert your shoe size if necessary. Can I get a Dune gift card? Absolutely, they are available here and make great gifts. Standard Delivery costs £3.50 - arrives in 2-5 working days. Next Day Delivery is also available for £6.50 - order by 5pm. Saturday Delivery is also available for £8.50. You can also place orders via Collect+ - Standard (£3.50) and Express (£6.50) options are available. Click and Collect is also available, and is free for orders over £50 (£2.50 otherwise) - arrives in 3-5 working days. Orders must be returned within 28 days of receiving your order. Returns to Dune are free, however - simply print off a Collect+ or Royal Mail returns label and return all items as they arrived. You can also return items in store (unless you've paid via PayPal). You can also reach Dune Online via their online chat - click 'live chat' at the top of the page. Dune is one of the UK’s leading shoe retailers. If you love shoes, then Dune is the store for you, with luxurious, catwalk inspired styles for both men and women - you can make great savings with a Dune discount code from vouchercloud for the summer. As well as the brand's own beautiful designs, you can find your favourite designer brands like Ted Baker and Ralph Lauren in the collections too, so Dune really is every shoe lover's ideal online destination! 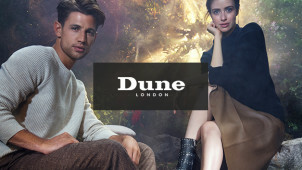 Dune was first founded in 1992, as a single concession in one department store in London. Over a fairly short space of time, it became one of the most talked about British footwear brands, and is now a mainstay on the UK high street, as well as a brand regularly featured in fashion magazines and newspapers. With the excellent online store, Dune has made shopping for the coolest styles in shoes and boots even easier, and have also expanded their global reach. If your summer event calendar is filling up, make sure to head to Dune for its smart styles and fashion forward looks for the evening. Here you can find all types of heels to set off your evening gown or party dress for that wedding reception. Shop with a Dune voucher code and save on stilettos, wedges, closed toe pumps and much more. With beautiful bags available too - it's easy to jazz up your evenings out with Dune.